The U.S. building transportation industry is regulated by state and in some instances local authorities having jurisdiction (AHJs). 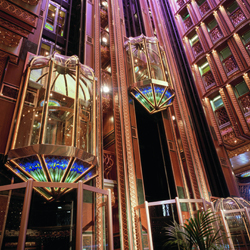 The regulations enforced by the AHJs include but are not limited to the Safety Code for Elevators and Escalators, ASME A17.1/CSA B44; Performance-Based Safety Code for Elevators and Escalators, ASME A17.7/CSA B44; Safety Code for Existing Elevators and Escalators, ASME A17.3; National Electrical Code® (NEC®); International Building Code (IBC); American National Standard Accessible and Usable Building and Facilities, ICC/ANSI A117.1. NEII® supports adoption of the latest edition of the codes without modification. However that is typically not the case. NEII members have access to the CodeFinder database to assist them in navigating the complex jungle of local codes and regulations. For International Building Code (IBC) information and inquiries, click here. To access documents supporting NEII's position on codes and standards, click here. To find out more about the current code and elevator safety, click here for some frequently asked questions.